On September 15, 2017, there was a tag sale in the small town of Smithville, Texas (outside of Austin). 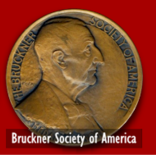 During the sale, a resident e-mailed to me that a Bruckner Society "plaque" was on sale for $5.00. He did not buy it, but he was curious about it and did some research on the Bruckner Society. He found our website and he contacted me. The plaque that he saw was one that honored the Bruckner Society of America's past president, Dr. Martin G. Dumler. The plaque appeared to have been installed at Xavier University in Ohio. Just how it got to a tag sale in Smithville is an unsolved mystery. The man who told us about it went back to purchase it for us but it had just been purchased a few minutes before he returned. With assistance from this helpful caller, a search went out on Smithville's Facebook page and other local websites. 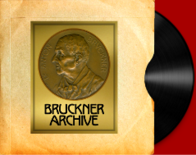 Ten days later, I was contacted by the person who bought it and I am happy to report that the plaque is now safely back in the hands of the Bruckner Society. by painter-sculptor Wilma Prezzi. It will hang in the Music Library. As mentioned, Wilma Prezzi (1915-2002) was a noted painter and sculptor. There is no mention in the journal of a plaque being presented to Xavier University (the presentation date on the plaque is December 22, 1958) and early attempts at finding any information from Xavier has led nowhere. So there is a possibility that the plaque was never presented. I started to research Dr. Dumler, since I was wondering if any Texas connections could be found, but this is where the story takes a bizarre and macabre turn. The Society has plenty of information on the life of Dr. Martin Dumler. 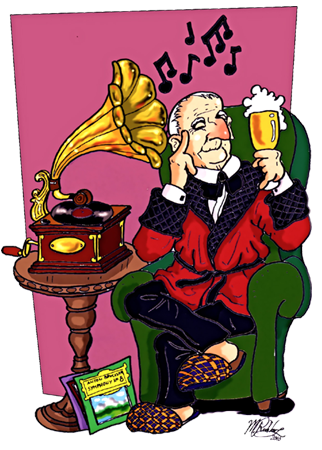 He was a very successful businessman, a composer of religious music, a painter and a community leader. His obituary in the Cincinnati Examiner in October of 1958 mentions his children and I was wondering if any of them may have "Gone to Texas," but instead I found out that his grandson, Martin G. Dumler II had been brutally murdered along with his wife and his mother-in-law in 1969 in the bedroom of his home in suburban Cincinnati. The story was extensively covered in the Cincinnati papers and a section of J.T. Townsend's book, Queen City Gothic: Cincinnati's Most Infamous Murder Mysteries. discusses the case in detail. The brutal triple homicide has never been solved. The only link I could find is that the last name of the person who purchased the plaque at the tag sale has the same last name of one of the murder suspects. Now, if that was the last name of the person who SOLD the plaque at the tag sale, then I could possibly be venturing into dangerous territory.